Don’t worry, Paula Abdul will not be referenced in this post. (Anymore than she already has). There’s this verse in Proverbs you’ve probably heard before. It says, “…in all your ways acknowledge him, and he will make your paths straight,” (Proverbs 3:6). I’ve typically thought of “straight” as “not crooked”. Direct. Not weaving in and out. A line from point A to point B. Straight. And with this definition in mind, I subconsciously (?) substitute “easy” for “straight”. My flesh prefers the verse to read, “…in all your ways acknowledge him, and he will make your paths easy,” (KLT – Kelly Levatino Translation). Yes, easy is a comfort to my soul. I like easy. I like formulas. I like a formula that says “Do X, and Y WILL HAPPEN!” Acknowledge God, and you WILL have an easy life. But there’s a problem with this interpretation of this verse. If you’ve lived very long, you realize it isn’t true. But we know the Bible is true. It’s not the words that are wrong. It’s my interpretation of the words. My understanding must change. And over the weekend, it did. Straight paths are not always easy. In fact, they can be quite arduous if they are not also flat. 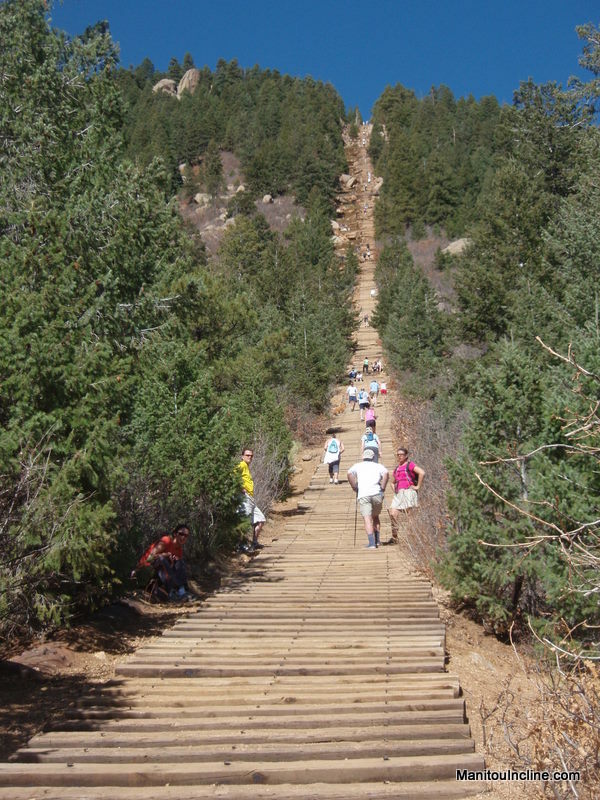 The internet tells me the Manitou Incline (left) in Colorado Springs is less than one mile long, but it climbs over 2,000 feet along the way. To be sure, the path is straight. Straight up. It does not waste your time, winding serpentinuously up the mountain. It does not make the hiker wonder how much farther, where the end is, or which way the path will turn next. The path is clear-cut. At anytime the hiker can lift his eyes and see the end point. The direction is sure, never changing. But the path is anything but easy. It is reported that world-class athletes take 20 minutes to complete this hike, while “first timers and people from lower elevations are taking a little over an hour.” To go less than a mile. On a straight path. So it is with the Lord. “…in all your ways acknowledge him, and he will make your paths straight.” He will make our paths clear-cut. He will make our paths sure. He will make our paths certain. He will not waste our time. He will make our paths lead to the goal, and the goal will always be in sight. But it may not be easy. It may be the hardest path we’ve ever set out on. It may be straight up. But if we acknowledge him and lean not on our own understanding, we can trust that this path is best – best for us, best for others, and best for God. Hi Kelly, I liked the message in your post. Just wanted to share a related thought; for the christian the journey is not on the horizontal plane from point A to Point B to Point C rather it could be understood as in a vertical plane, like fron A1 to A2 yo A3. This is the way to the Kingdom of God to which He will lead us as we trust Him. God Bless. Great post! The mistaken belief that the “straight” path is easy is communicated subtly all to often to unbelievers and new Christians and then when the path gets hard they are left thinking they have done something wrong. It’s not an easy walk, but oh so worth the challenges! And yes, I now have the Paula Abdul song running through my head! The visuals were really helpful in conveying this message. Great job! It doesn’t get any clearer than this.